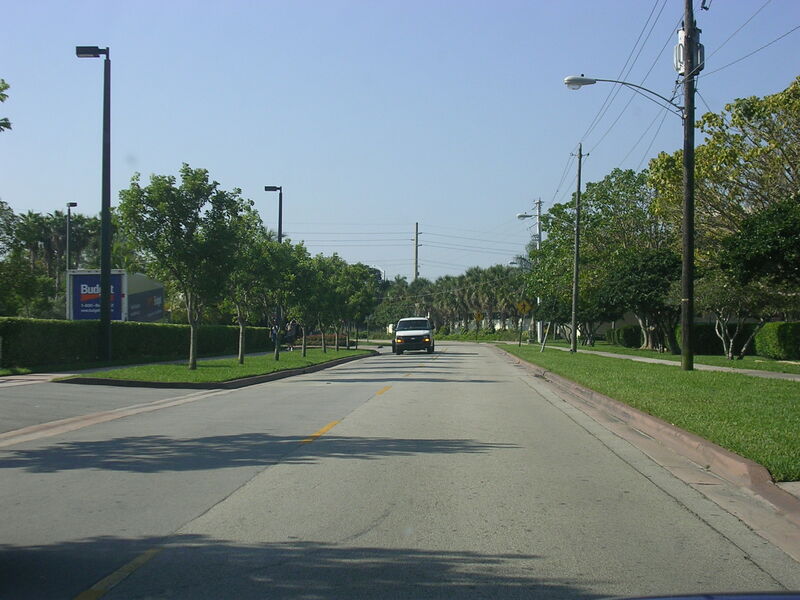 It took me literally all school year to get some new photos of some South Florida roadways, but here are some fresh sights from May 9, 2005. 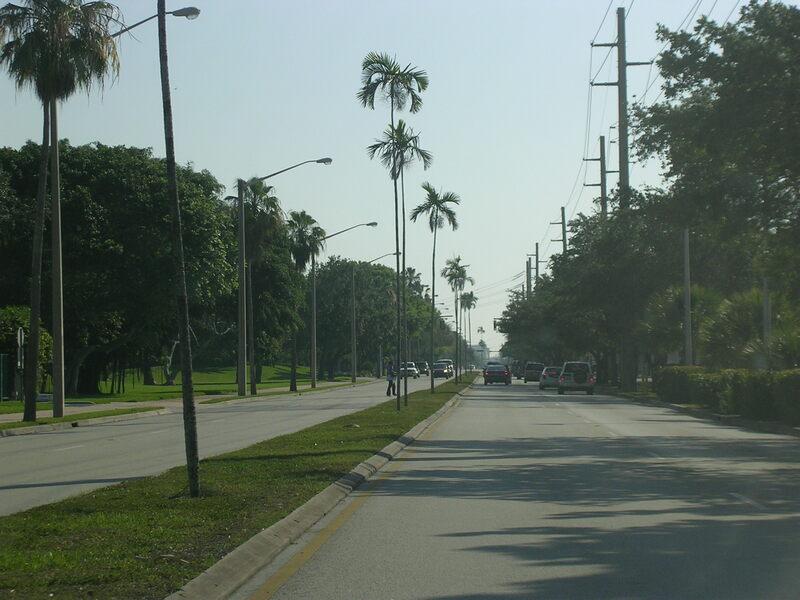 Dickinson Drive heading out of the University of Miami in Coral Gables. Heading north on Ponce de Leon Blvd. in Coral Gables. 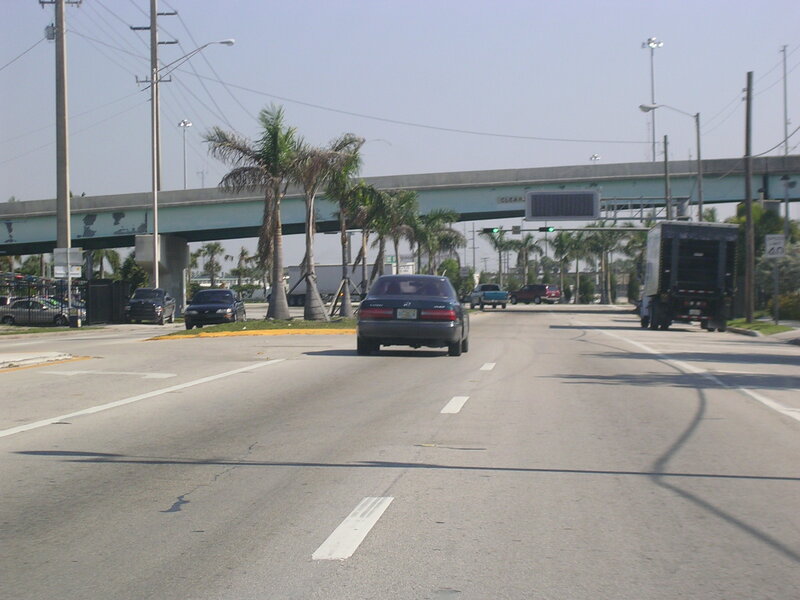 To the left is UM and to the right is the Miami Metrorail and immediately past the Metrorail is US 1. 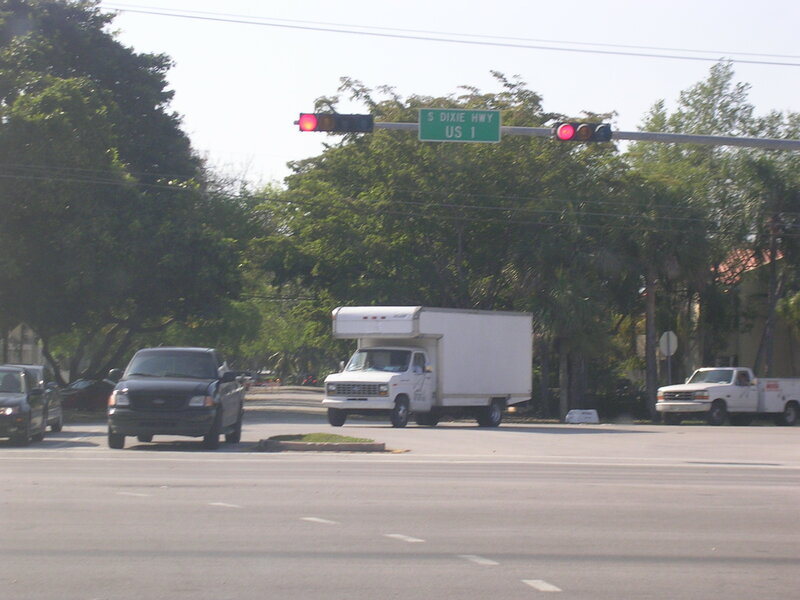 US 1 is known as South Dixie Hwy. in these parts. 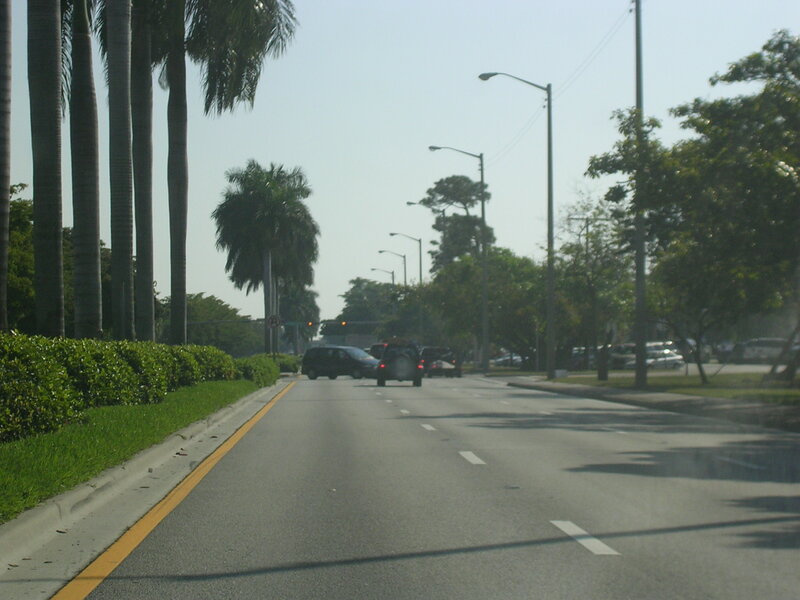 North on US 1, Dixie Hwy, in Coral Gables. 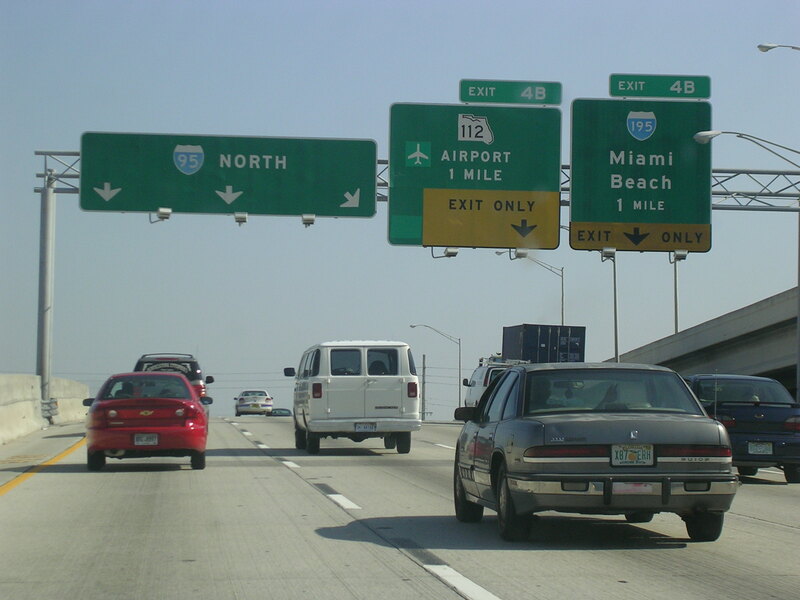 From I-95 and on south to Homestead, US 1 is six lanes with a median and very busy. Unless it is 1 am, there is always traffic on this road. 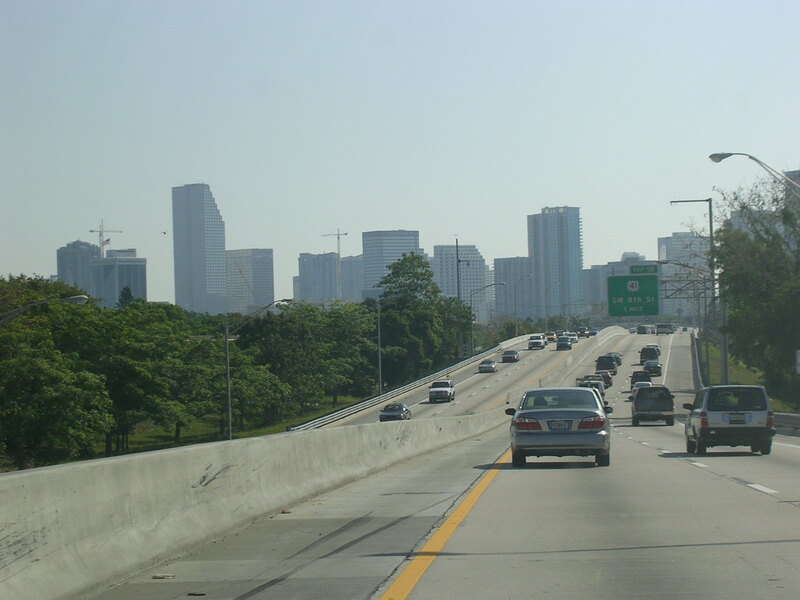 US 1 curves to the right to become Brickell Ave. into downtown Miami, while I-95 begins its journey up to Maine right here. 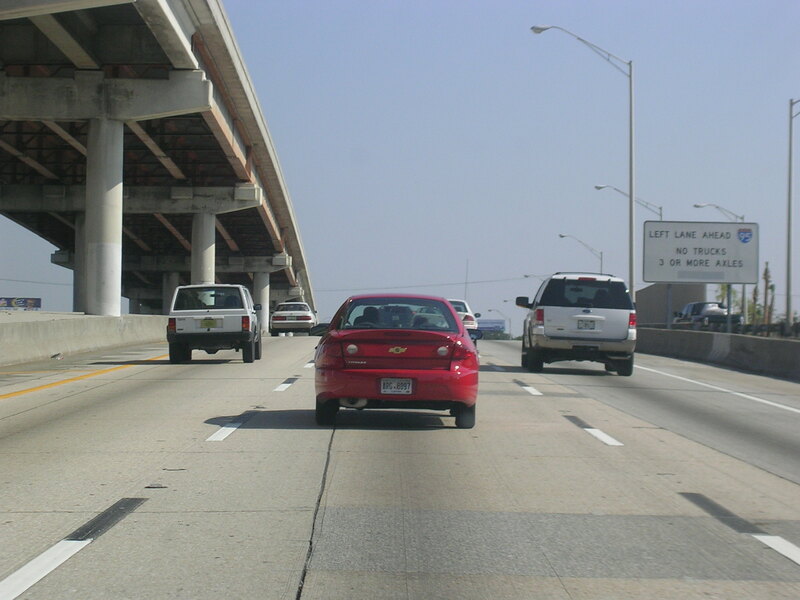 The first curve on I-95. 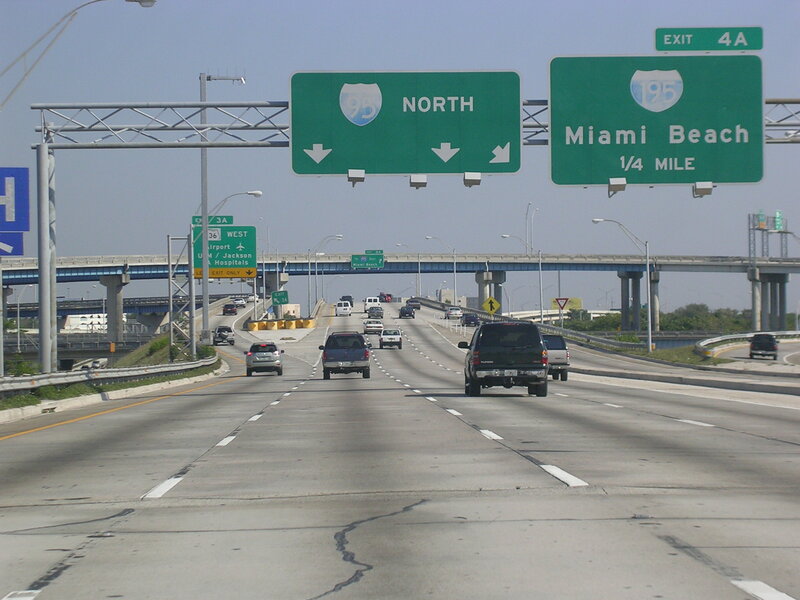 NB I-95 approaching the first exit, which is for US 41. 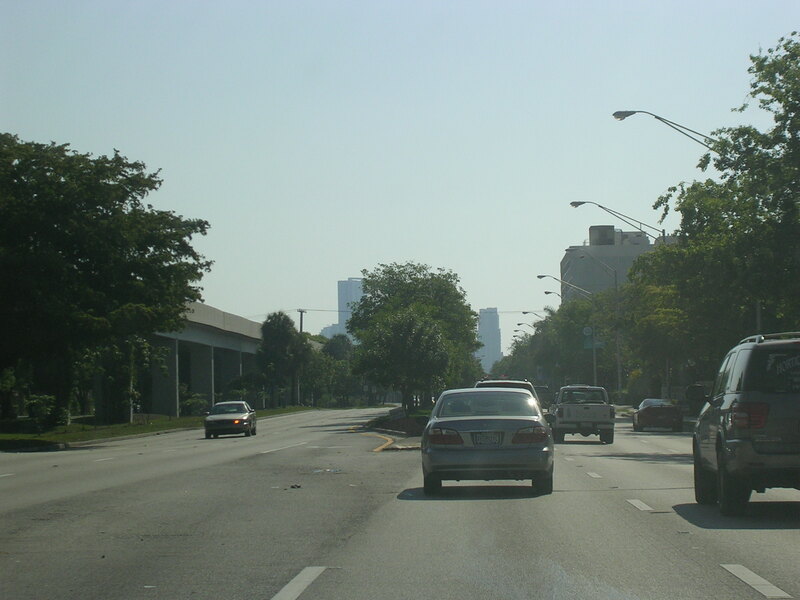 Known as Calle Ocho in Little Havana, it is also generally known as 8th Street and Tamiami Trail. My favorite building in Miami is on the right. It is green glass with an arch in the middle of it, called the Espirito Santo Plaza. CSI: Miami has great shots of it sometimes. 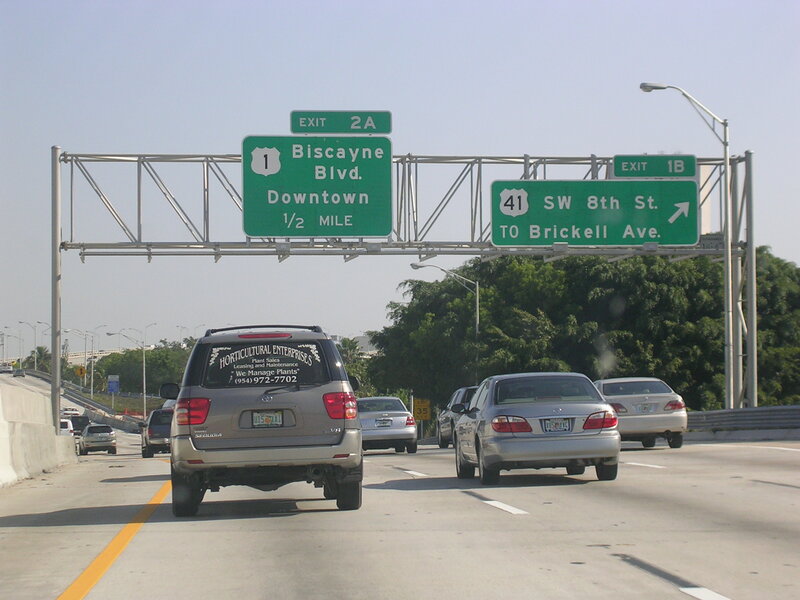 The exit for US 41 and the signage for Biscayne Blvd and US 1. 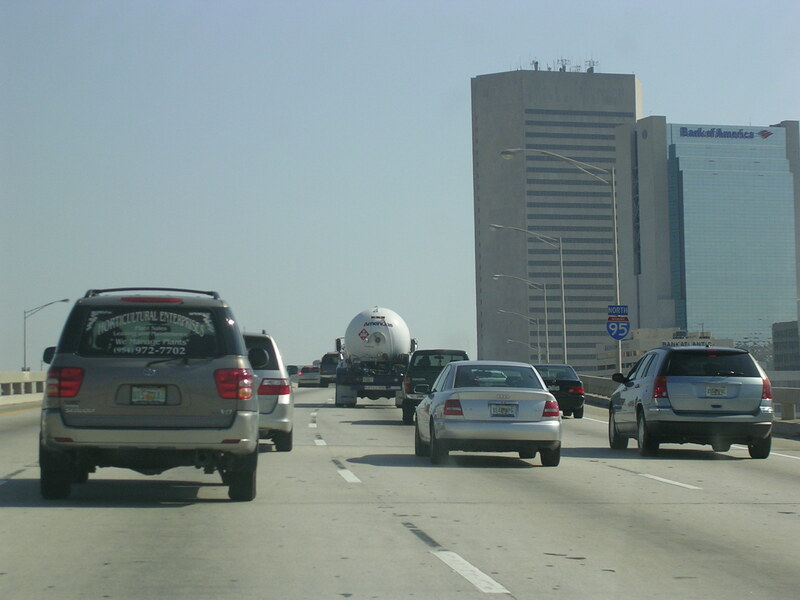 NB I-95 passing one of three Bank of America buildings in the city. 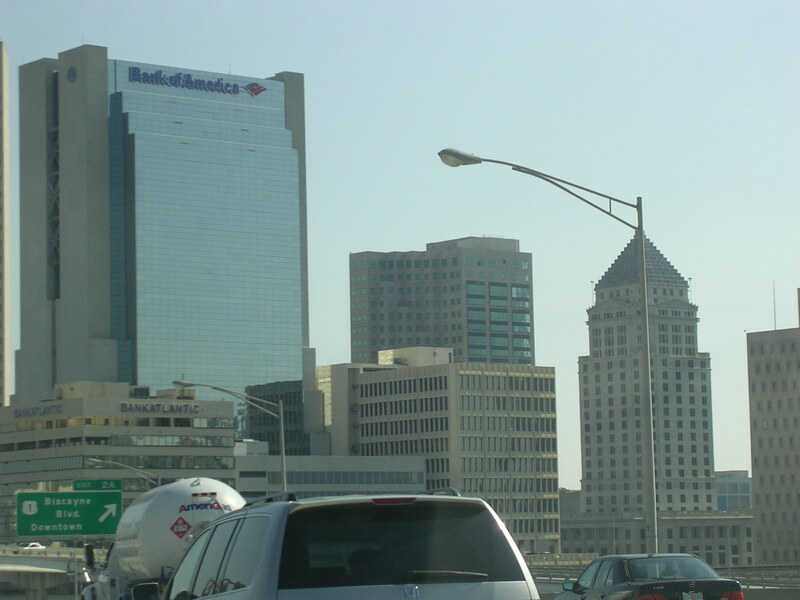 The same Bank of America building with the Miami-Dade County courthouse to the right. Exit here for the Triple A, the American Airlines Arena, where the Heat decimate anyone foolish enough to challenge them. 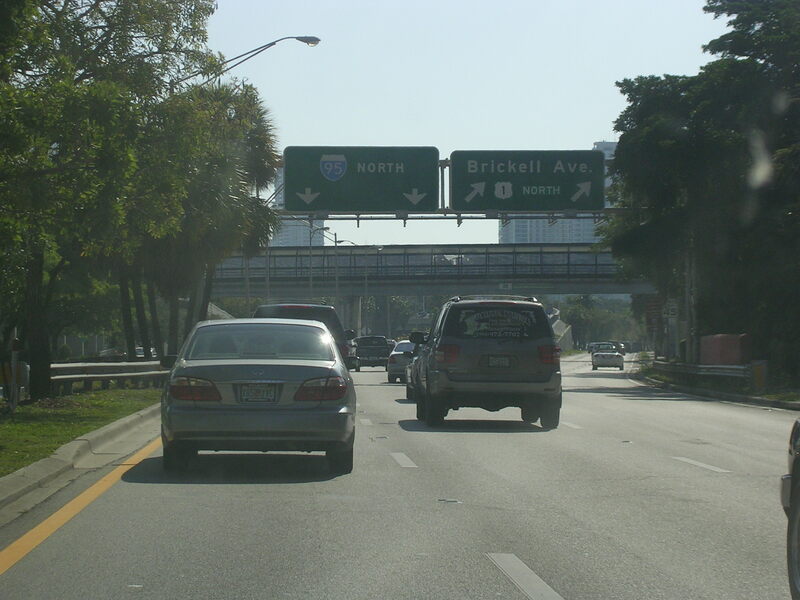 I-95 NB at I-395 and FL 836. 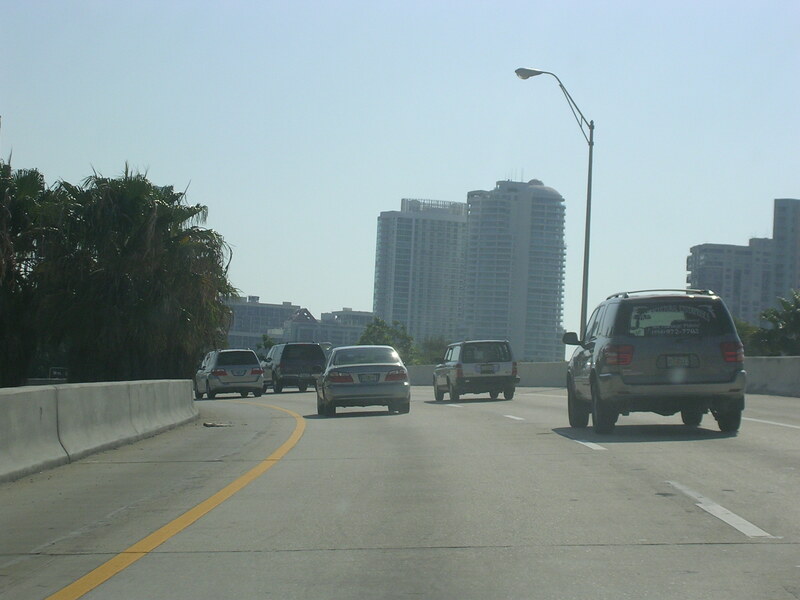 FL 836 is the Dolphin Expy and goes to the airport and turns into I-395, which dumps into South Beach. There are some pretty faded BGSs here. 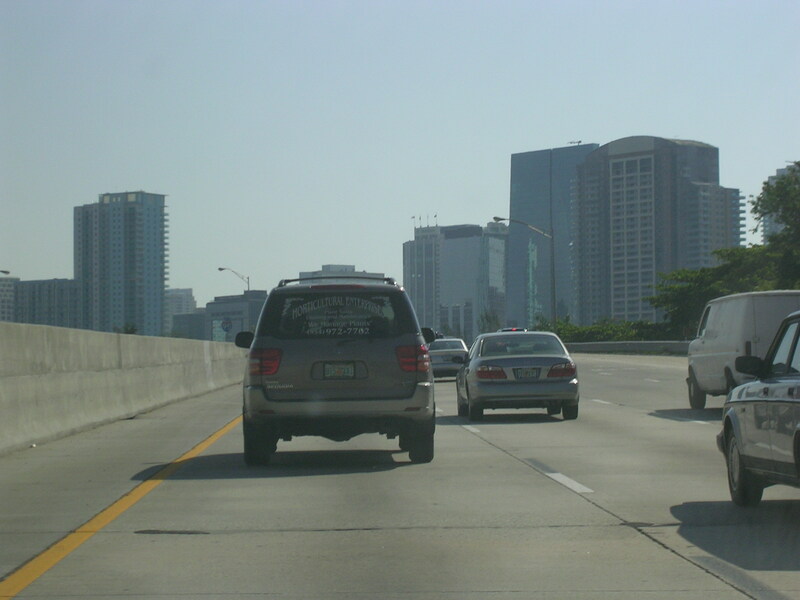 These are the same shields that I took pics of in 2001, as seen on my Old South Florida Pics page. More faded shields as we approach FL 112 and I-195. 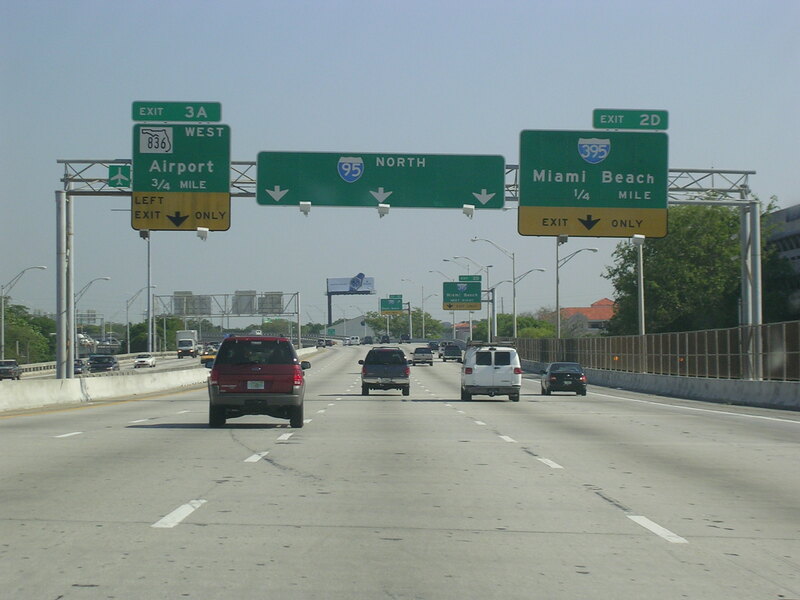 These roads head to the same places, respectively, as FL 836 and I-395. 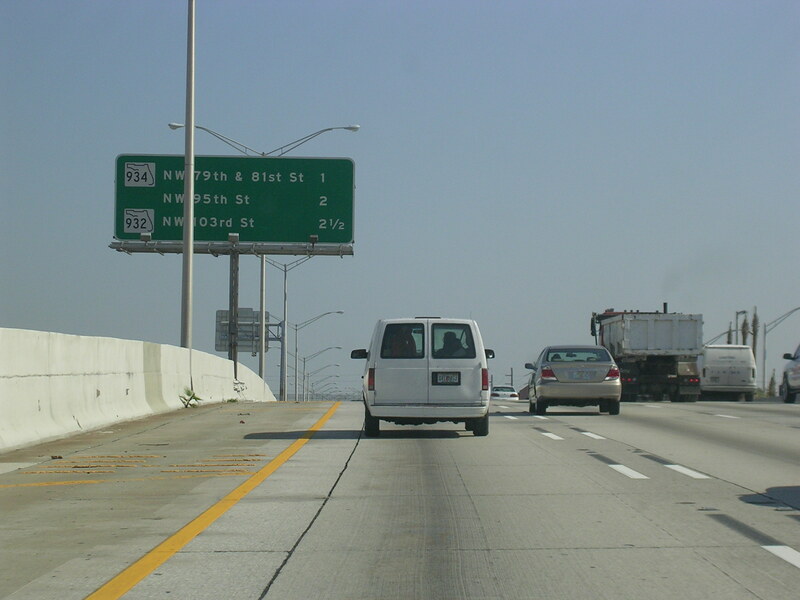 I-95 north of the downtown area. 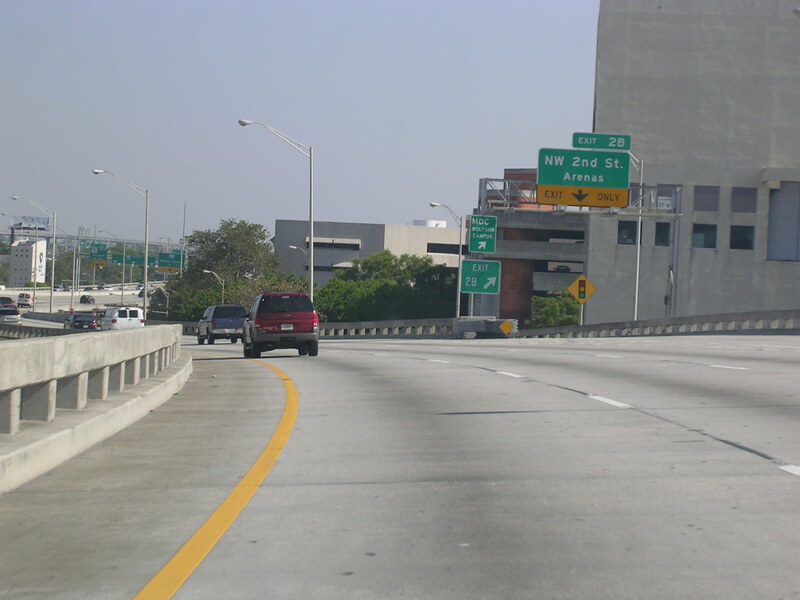 The ramp from FL 112 comes in from the left and turns into the I-95 HOV lanes. 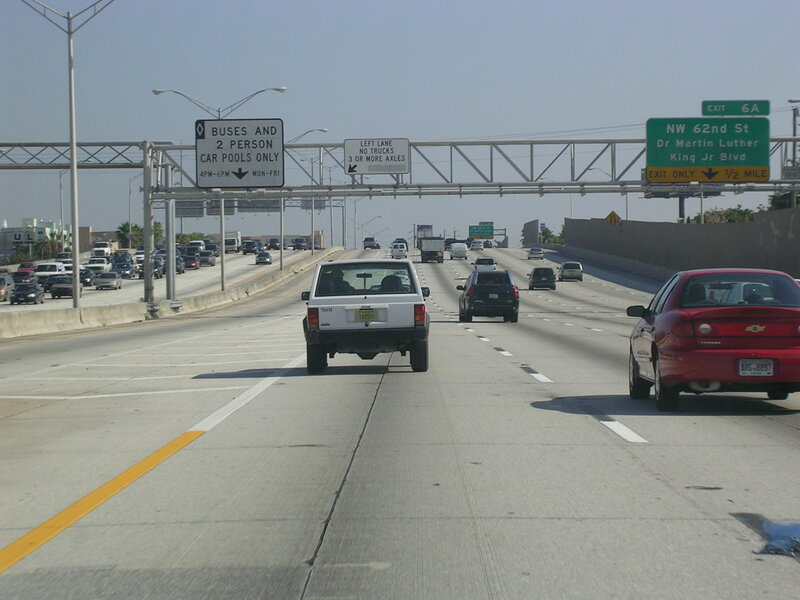 Here is the beginning of the HOV lanes. 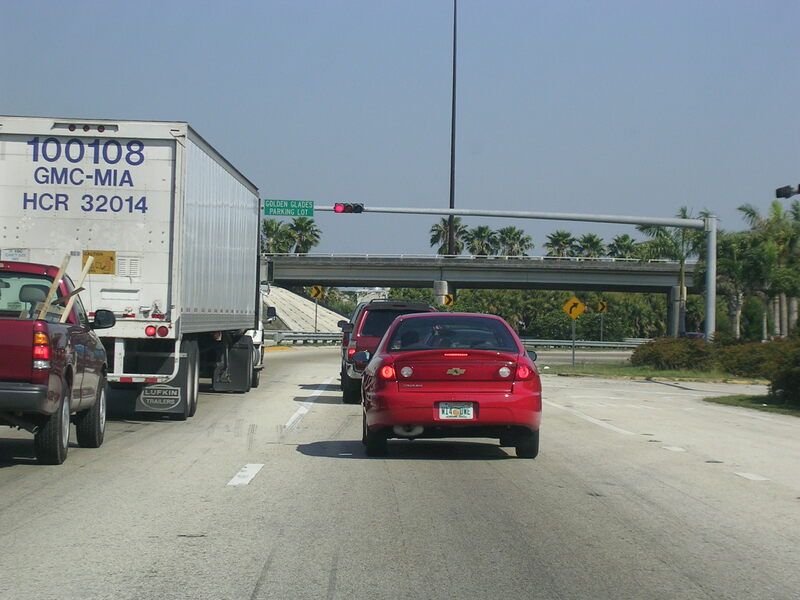 South Florida freeways have their distance signs raised and in the middle of the road. 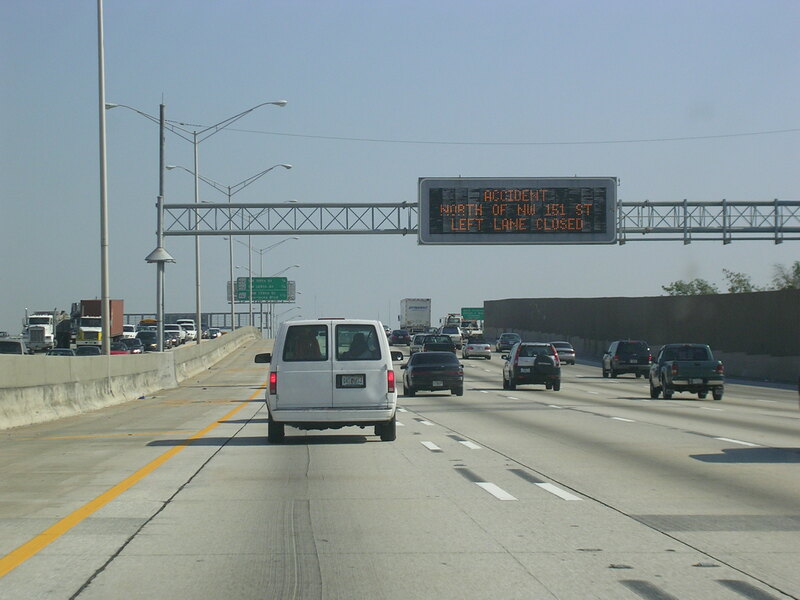 These variable message signs are very handy for avoiding backups, such as the one that is just ahead. I detoured. 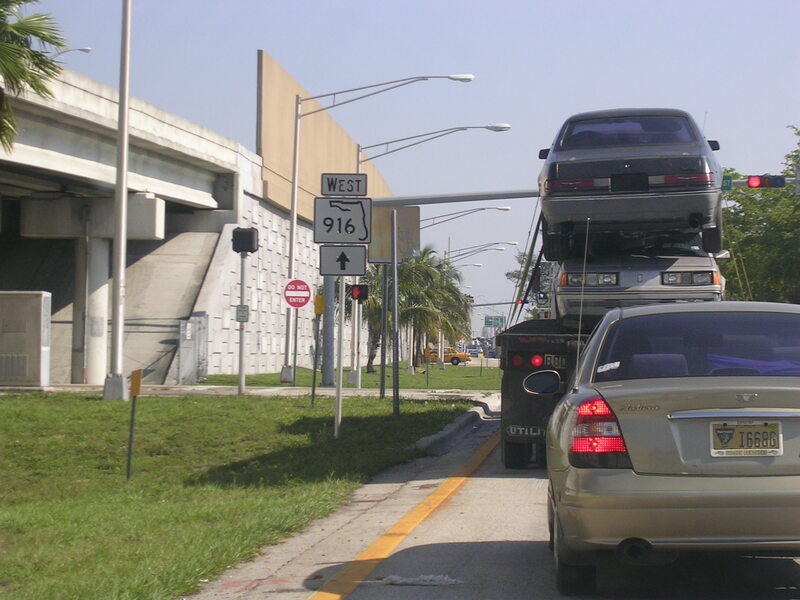 To avoid the accident at the Golden Glades interchange, I got off at Opa Locka Blvd. (FL 916). And then turned immediately onto US 441 North. 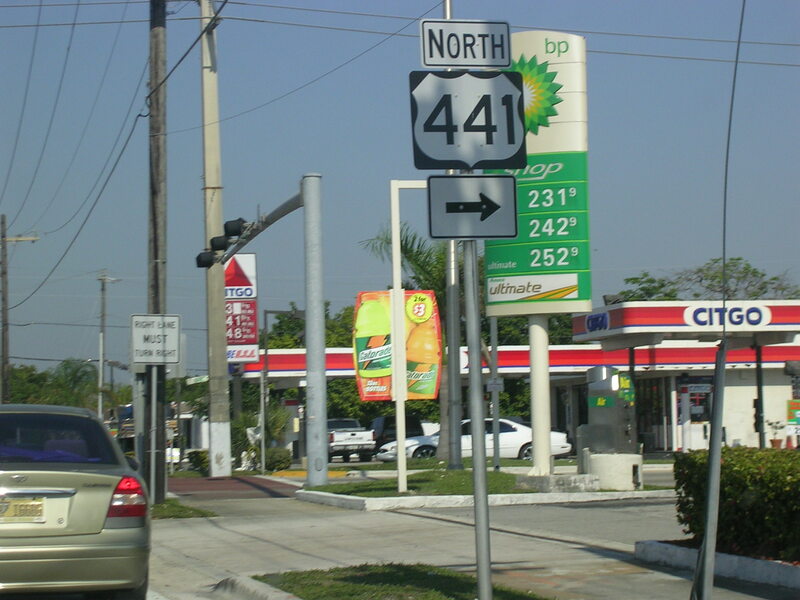 US 441 North preparing to go through the Golden Glades interchange, which involves US 441, FL 826, the Turnpike, and I-95. There's also a parking lot for express busing. It even gets its own exit from I-95.